I’m probably getting WAY ahead of myself here, but Joseph and I are headed off to Paris (plus a couple days in London) for vacation in April and I’m already plotting what to bring with me. Nothing wrong with being prepared, right? Besides, I know spring break season is coming up, so maybe this will help with some packing list inspiration. I’m actually glad I started planning early because that gave me a chance to update a few travel necessities that I wasn’t in love with. I’ve got a whole series of packing tips planned, but I decided to start with the things that go with me on every single trip: my tech gadgets. I’ve always been a huge bookworm, and the Kindle has been a huge gamechanger for me when I’m traveling. No more of this buying random books at the airport, or worse, finishing my book halfway through a flight. I just download a few before I leave, and then I’m set. I’ll admit I get a little frustrated at my Kindle because it runs pretty slow sometimes (memory leak in the software, maybe?) but having months’ worth of reading material that barely takes up more room than my passport is well worth it. The case, by the way, is from Amazon. I used to take over the ear headphones with me on every flight, but the past couple I sort of gave up on it because they take up a lot of space in my purse and they’re pretty uncomfortable if I’m trying to sleep. I recently got a pair of CozyPhones (kindly provided by the brand for me to try) and they solve both of those problems. They’re flat headphones inside a soft headband, so they don’t force your head into an awkward position or dig into your ears. The lining is made from a synthetic mesh, which means they don’t get too hot. I have the corded ones, but there’s also a bluetooth version if you’d rather go wire-free. And for those of you with kiddos – they also make a volume-limited kids’ version that comes in tons of cute patterns (www.cozyphones.com). I’m extremely excited to try these for flying. It’s an 8.5 hour, overnight flight to Paris, so I fully intend to hop on the plane, take a Nyquil and pass out as soon as possible. The fabric doesn’t completely block out sound (like the inevitable crying baby a few rows away), but it does muffle it. And what they lack in noise isolation, they make up for in comfort. The one worry I had was that people around me would be able to hear my music/white noise – I don’t want to be that person – but Joseph confirmed that he wasn’t able to hear it even in a pretty quiet room. Up until a few months ago I was a loyal iPhone user – I’ve been getting about every other model since the original came out. A quest for a better phone camera plus the recommendation from a friend convinced me to make the switch to the latest Google Phone, the Pixel 2. The switch from iOS to Android was pretty painless (I actually like Android much better), and the camera did not disappoint. In fact, I think for this trip I’m not even planning on taking my ‘real’ camera with me. I’ve found I don’t really like lugging a separate camera around, plus that’s just one more thing to potentially get lost or damaged. The difference in photo quality between my phone and camera is so slight now that I don’t really feel the need to bring both with me. Another great thing about the Pixel 2: it’s carrier-unlocked, so that means I don’t have to pay for AT&T’s ridiculously expensive international plan this time, yay! The plan is to just pick up a pre-paid SIM with enough data & texts to get me through the week. Any recommendations on pre-paid SIMs that are easily available in France would be much appreciated. I have a Garmin watch that I use for most of my daily smartwatch and GPS-tracking exercise needs, but my day job does this thing every year where they subsidize the cost of a Fitbit for employees in a not-so-sneaky bid to try to make us be healthy. I have no idea if that’s working out for them or not, but it does mean I was able to get the Flex 2 for free. It’s more comfortable than the Garmin for sleep tracking, and the interchangeable accessories make it easier to wear with outfits that a bulky watch doesn’t necessarily look great with. I expect to do a TON of walking, so I’m looking forward to an easy & fashionable way to track my steps. If you follow me on Instagram you might have seen my post about my nearly-brand-new IT Luggage carry-on, and the fact that the interior divider panel tore on my second trip with it. So – I needed a new carry-on, and since the husband is going on a work trip for two weeks right before our vacation, he’s definitely going to have to check a bag (even accounting for doing laundry). After lots of research, review-reading and price & warranty comparison, I settled on Away luggage for us. The warranty is pretty generous, especially for the price point, but what really got me was the 100 day no-questions trial period. We’ll be on planes, trains & public transport, so I can’t really think of a better scenario for testing them out – Joseph’s will even be going all the way around the world, since his client is in Saipan. And in case you’re wondering, yes, I do plan on doing a post-travel review. 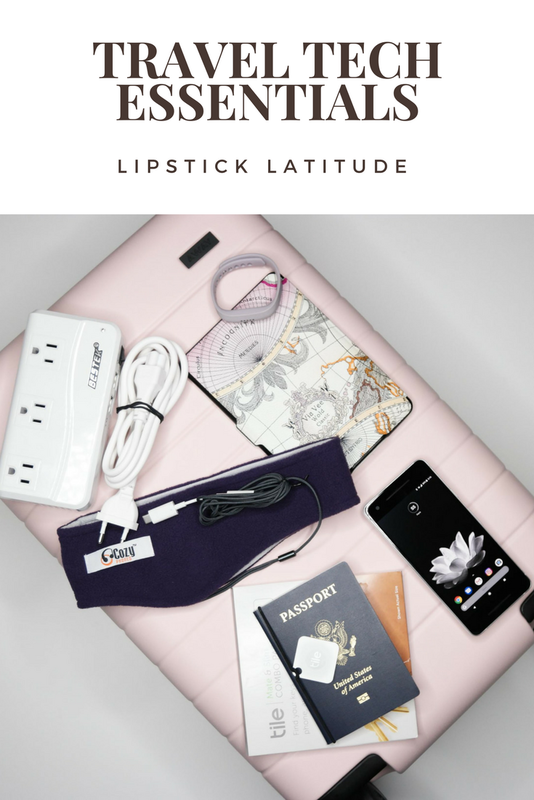 All that aside, the reason my new suitcase is in a ‘travel tech’ post is of course because of the smart luggage aspect – the Away carry-on sizes have a battery with USB ports, which would have been SERIOUSLY useful the last time I was on an international flight. Early reviews I read of the bag complained about needing tools to remove the battery, but now they’ve redesigned it so you can pop it out easily. In other words – I’ll also be able to stash it in my purse to keep my phone topped up while we’re sightseeing. Another nice perk? They send you international adapters for the charging brick. And just FYI, the link above has a $20 off coupon for you. Speaking of international power adapters – the USB power brick that came with my luggage will be great for charging my spare battery and phone, but that doesn’t help much with stuff like hair dryers, laptops and such. We grabbed an international power strip from Amazon a couple years ago for our trip to Spain, so it’ll be going back with us this time. I actually got this idea from the Away website. They sell a leather luggage tag that comes with a Tile Slim, which is a small bluetooth device that helps you locate any item it’s attached to. I thought that’s a great idea, and the tags are $30, which is the price of a single Tile Slim if you order it directly from their website. Buuuut, luggage tags are pretty easy to remove, and the Tile website has a combo pack of two Slims plus two Tile Mates (the smaller ones that can go on a key ring) for $60, which is a much better deal. Joseph and his luggage will be making something like eight stops in five different countries, so hopefully the Tile I put in his suitcase will help him make sure his bag gets onto each plane. I’m only planning to take a carry on so I don’t necessarily need bluetooth tracking for my luggage, but the potential for these is pretty much endless. I’ve put the Tile Mates on elastic bands to wrap around our passports, and you can also use adhesive to stick them to anything that’s in danger of getting lost or stolen – laptops and Kindles come to mind. 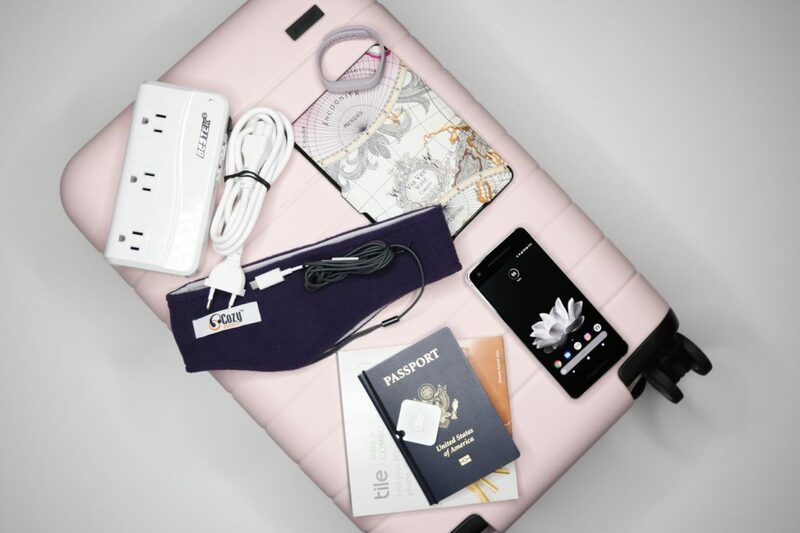 What gadgets are must-haves for you when you’re traveling? Oh I am absolutely intrigued by those earphones! I always travel with my iPhone, iPad (watching Netflix offline is a godsend), an adaptor (plus a multiplug so I can use it for more things but still only have 1 adaptor) and a portable charger. The tile in your bag is a genius idea! I should get one. I’m pretty excited about trying it!